That the BJP is not invincible – notwithstanding the aura it has built around itself – is obvious. It is high time that opposition parties get down to the task of forming a joint strategy to fight it. Bahujan Samaj Party supremo Mayawati’s recent statement that she will go it alone if she doesn’t get a ‘respectable number of seats’ may sound disturbing to those wishing for an opposition front against the BJP in the 2019 parliamentary elections. She would be a key pillar of any nation-wide coalition and had agreed to put up a joint candidate along with the Samajwadi Party and the Rashtriya Lok Dal in the Kairana by-election, where the BJP lost by a huge margin. 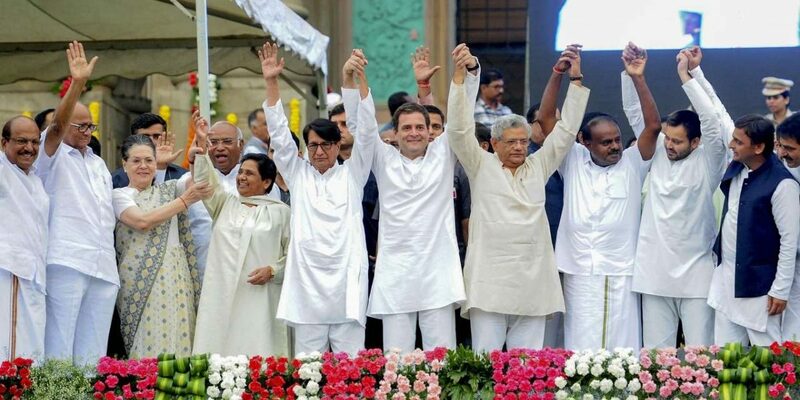 It had raised hopes that Mayawati, along with other political heavyweights such as Mamata Bannerjee and Sharad Pawar, would be part of a mahagathbandhan along with the Congress, which would play a key role. The situation could, and perhaps will, change in the coming months, and Mayawati’s posturing could be pre-negotiations grandstanding to get the best possible deal. But it clearly indicates that it is going to be a long, uphill struggle to get everything together and work out seat-by-seat adjustments. Most of the regional political leaders who will form any putative group have industrial-strength egos and over-weaning ambitions, especially since each one has gauged, not so incorrectly, that the big prize could be within their grasp. But each one should also know that if they don’t hang together they will hang separately. Forming coalitions, especially with those whom one otherwise considers as rivals, direct or indirect, is never an easy task. In the past, many such efforts have collapsed. The experiences of the past are fine, as is the jockeying for political space, but gone are the days when anyone had the leisure to take a risk and go it alone. This is a ‘do or die’ election that could end up annihilating them and sending them into irrelevance. The politics of today, therefore, calls for a re-imagination of the idea of coalition itself. They need to move with the times and understand the crucial issues involved. Perhaps these political veterans could learn a thing or two from young student leaders. In recent times, these students have shown great sagacity and strategic thinking in taking on the Akhil Bharatiya Vidyarthi Parishad (ABVP), the student organisation aligned with the Sangh parivar and then ensuring its defeat in various university elections. The most recent example that of the Jawaharlal Nehru University, where the ‘Left Unity’, a grouping of Left parties, won all four key posts to the Students’ Union. Four Left organisations, including those affiliated to the CPI, CPM and the Communist Party of India (Marxist-Leninists) Liberation, were part of the Unity. What makes Left Unity so significant is that these outfits had in years past been bitter rivals. Ideological purity is sacrosanct for the Left, and many a battle has been fought over the minutiae of what the great canons and masters said – deviations are unacceptable. For outfits that had serious differences to come together on a single platform and then fight a common enemy is radical. Yet, after the arrest of Kanhaiya Kumar, Umar Khalid and Anirban Bhattacharya, and the whole bogus campaign to term them ‘enemies of the nation’ by slapping sedition charges against them, these organisations realised that something had to be done to not just save the charged students but also the university and its unique ethos. 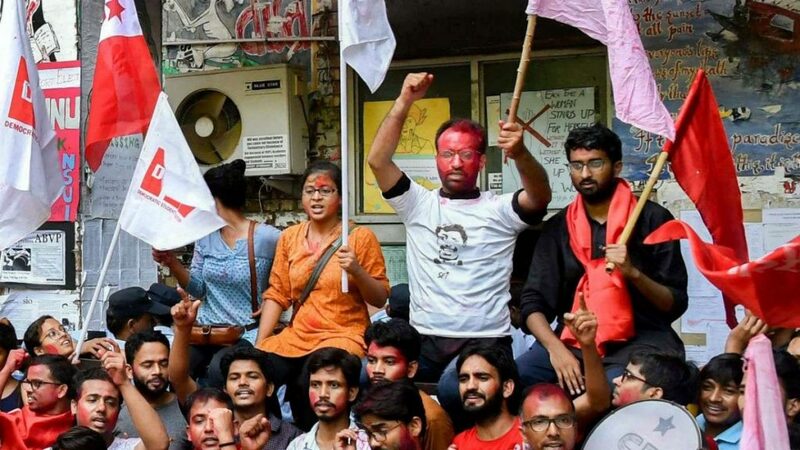 The results are for all to see: the united Left saw their collective vote share go up to over 45%, while the ABVP came a distant second with just over 18%. The student body has sent out a clear signal: we don’t want the Sangh parivar and their culture to permeate the university. Similarly, Punjab University, for the first time, has seen the victory of a female candidate (from another Left organisation) as the Union president, defeating Congress and Sangh student fronts. The ABVP has won key seats in Delhi University, but here too Left student groups have seen their presence increase. Extrapolating these results to gauge the national mood would be unwise. An election even at the municipal level, forget for the state assembly or the Lok Sabha, is very different and not just in scale. After 2014, the dynamics have changed significantly — the methods of campaigning, the emergence of personality-based politics (at which Narendra Modi outclasses the rest) and, of course, money power, which has reached unprecedented levels. The BJP is in the lead on all these fronts – the challengers, whether the Congress singly or the opposition parties collectively, are handicapped in several ways. Add to that the BJP’s force multipliers – a helpful (to use an understatement) media, the cadre on the ground and the troll armies online – who give it a distinct advantage. Yet, as we have seen in state-level elections since 2014, the BJP can be defeated – Delhi and Bihar are examples – or given a scare. In some states, the BJP formed the government even though it was not the single largest party, though that stratagem failed in Karnataka. What is obvious is that it is not invincible, notwithstanding the aura it has managed to build around itself. To achieve that, opposition unity will be paramount. The emergence of regional parties, some of which are extremely strong, presents both advantages and challenges for the BJP and the Congress. Building coalitions will be critical, and here the BJP once again has the edge since it is the ruling party and is widely expected to get the highest number of seats. Its partners will extract their pound of flesh, and the BJP’s high-handed ways have put off several erstwhile allies such as the TDP, but the lure of power is a great cementing force. The opposition parties will have to go beyond their mutual fear of the BJP and their apprehension that the results could make or break them. That should be motivation enough, but it will call for maturity and vision to set aside their egos, their posturing and their short-termism. Mayawati may want more seats, but she needs to understand that without being part of a larger, more powerful front, she could end up with a big zero. Similarly, Akhilesh Yadav understands what he has to do, but he will have to fight the naysayers in his own party and form a wider alliance with the BSP, the RLD and perhaps the Congress. The same applies across the board to the Trinamool Congress, the JD (S) and the TDP. Once again, student politics provides some helpful lessons. The Left parties of JNU knew they didn’t have to just win the elections but also thwart the ABVP’s attempts to take control of the premier graduate school. An ABVP win could have a devastating impact on the institution’s future, especially with a friendly administration and a helpful Central government at the helm. The BJP and the Sangh parivar have relentlessly tried to impose their will on the education sector both at the school and the university level, and JNU would have been a glorious prize for them. Violence ensued when the ABVP was routed in the JNUSU elections, and defence minister Nirmala Sitharaman – a JNU alumna herself – took time off from defending the Rafale deal to declare that the university’s students were waging a war against India. The signposts for the future are clear: the BJP will not admit defeat gracefully and move on to fight another day. It is not as if the regional political parties are totally unaware of the challenges before them. There is the additional incentive of arriving on the national level. But they will have to change their ways — public posturing to send out a message to the others may get you the headlines, but it is counter-productive. Why not work it all out behind the scenes? Other parties and leaders haven’t reacted or taken their own apparent hardline positions so far, and they should avoid any such thing. It is time they all got down to the difficult – but necessary – task of creating a viable opposition to the powerful BJP.